Two sets & costumes. Relive the best of The Beatles’ greatest hits from albums like Please Please Me, Hard Day's Night, HELP!, Rubber Soul & Revolver, Magical Mystery Tour, Sgt. Pepper, Abbey Road, Let It Be, Hey Jude. Feel the magic of Beatlemania! Our big show, inspired by the book "It's Sid Bernstein Calling..." a two-hour Beatles extravaganza. Includes 4 costumes, an outstanding multimedia show and even a few surprises! Trust us when we say that FAB 4 Ever is not your typical Beatles tribute show. In 2012 we recorded remakes (covers) of 2 awesome Beatles songs – "Yes It Is" and "Think For Yourself". As far as I know we are the only Beatles Tribute band to have officially released original songs on iTunes. Check out our Beatles and Original songs and albums on iTunes! In August 2012 to celebrate the Beatles 50th anniversary and a very important day in Beatles' history – Aug. 18, 1962 (the day of Ringo's first show as a Beatle), REPLAY released an original "Beatles-style" song and music video. Once in a lifetime you get to meet a living legend... read my Sid Bernstein story. REPLAY Pens, Posters, Photos, Postcards, T-Shirts and more! Check out all the goodies available at REPLAY shows and events. Many bands imitate The Beatles. REPLAY makes you feel like you have seen The Beatles. 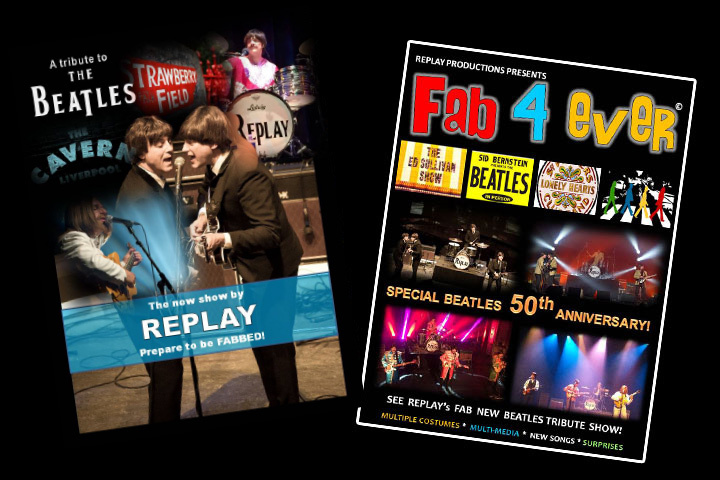 Since 2002, REPLAY has been Canada's most popular and authentic Beatles Tribute! No other Beatles tribute makes you feel the aura and magic of The Beatles like REPLAY! With Liverpudlian accents, unscripted banter, authentic costumes and instruments, you will feel you are watching John, Paul, George and Ringo! and considered Canada's most authentic and popular tribute to the Fab Four. The show features 34 songs from The Cavern to Abbey Road. Replay is not endorsed or affiliated in any way with Apple Corps or The Beatles.